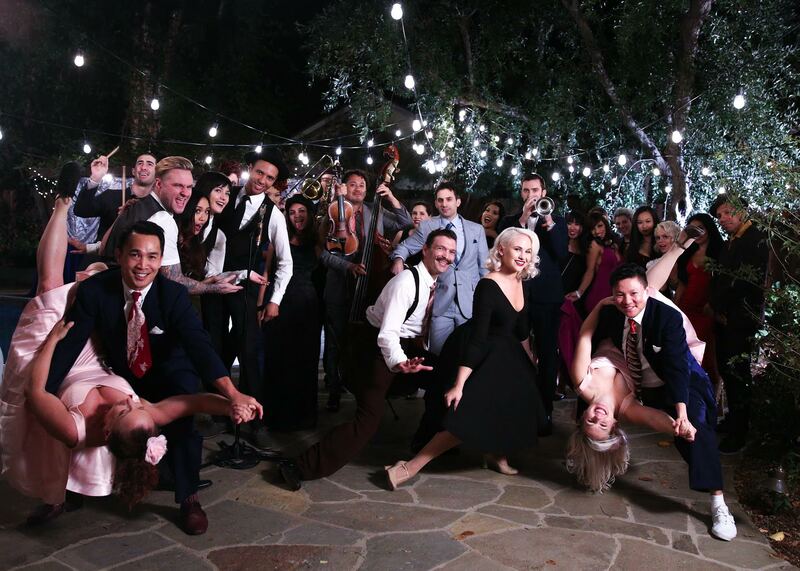 PMJ Gives Thanks With “Don’t Stop Believin’” – a Dazzling, One-Take Video Epic! We say it as often as possible, but we can never say it enough: Postmodern Jukebox could never have come as far as we have without the support of our incredible fans. To kick off this holiday season, we’d like to say thank you with our most ambitious “journey” to date – a showstopping, one-take video that is our way of giving back to you, but also shows what’s possible when none of us stop believin’. An all-star cast, including Sara Niemietz and American Idol alums Rayvon Owen, Thia Megia, and Blake Lewis, drop by for a swinging Turkey Day extravaganza, and you’re all invited! Gravity. Touch of Evil. Birdman. Rope. Some of cinema’s most breathtaking sequences have been accomplished with a single, unbroken take. Well, we’d like to modestly add PMJ to that Hollywood pantheon with our latest video, which travels beyond the studio walls and goes on and on and on and on – to a Thanksgiving party like no other thanks to Sara Niemietz and American Idol alums Rayvon Owen, Blake Lewis, and Thia Megia. “Don’t Stop Believin’” is the perfect song to help celebrate how far we’ve come and how much we owe our fans for doing their part to keep expanding our vision for Postmodern Jukebox. No, Scott Bradlee wasn’t born and raised in South Detroit, but in taking the leap of faith that was PMJ he basically took that midnight train going anywhere. So thanks to all of you for coming along for the ride – Happy Thanksgiving, and Never Stop Believin’! Want to see more of this cast? Check out some more of our covers below! Sara Niemietz: “Love Yourself”, “Just What I Needed”, “Who Can It Be Now”, “Scars To Your Beautiful” and more!